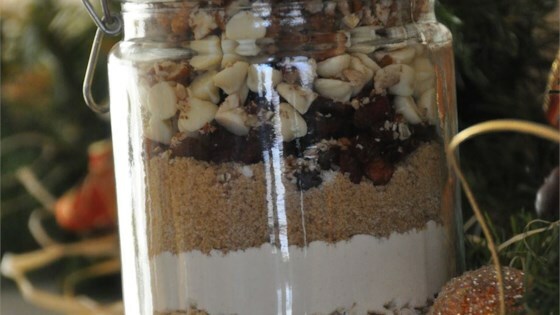 "A beautifully festive cookie in a jar recipe. These make great gifts." Give cranberry hootycreeks as a memorable gift of "cookies in a jar." I made twenty of these for gifts - and they look so nice, I'm not sure if I'm going to actually hand them out! For the cooking novice, note that 5/8 Cup = 1/2 Cup plus 2 T.
When the ingredients were packed down, this recipe only filled the jar 3/4 full. I just added more cranberries and white chocolate chips.